Rainfalls have been shown to trigger the spread of many foliar diseases, with tremendous consequences for agricultural outputs. But how do they proceed ? How are the pathogens physically transported ? Is the risk of epidemics the same for every plant at any time ? 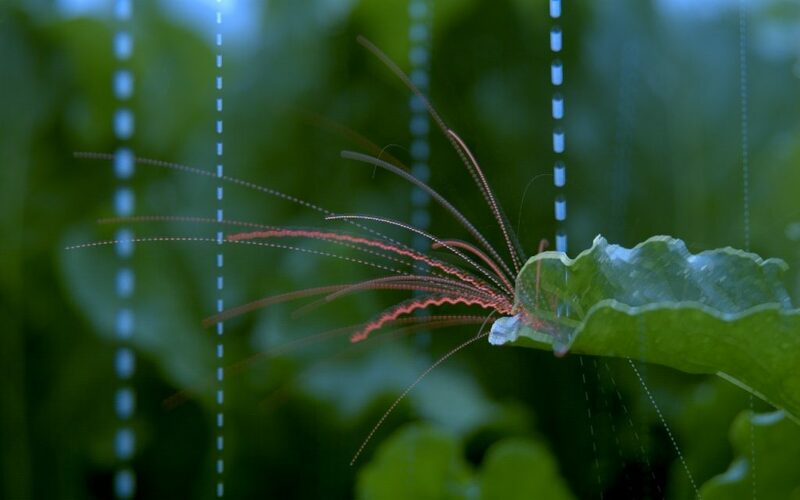 This research project aims at understanding how the laws of physics shape the rain-induced dispersal of pathogens, by looking at the scale of individual raindrops. A wealth of fluid mechanics arises from the impact of raindrops on plant leaves. In order to identify the most relevant for pathogen dispersal, we have taken high-speed movies of rainstorms in the fields. First, water residuals from previous impacts have to dissolve the mucilage that surrounds the pathogens. 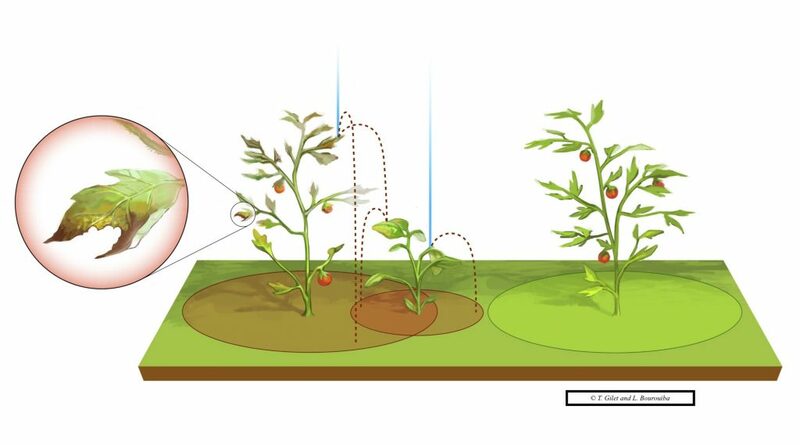 Then, when the pathogens are in suspension in these sessile water droplets, two scenarios may likely happen that would both efficiently shoot pathogens away, towards the next plant: splashing and inertial ejection. 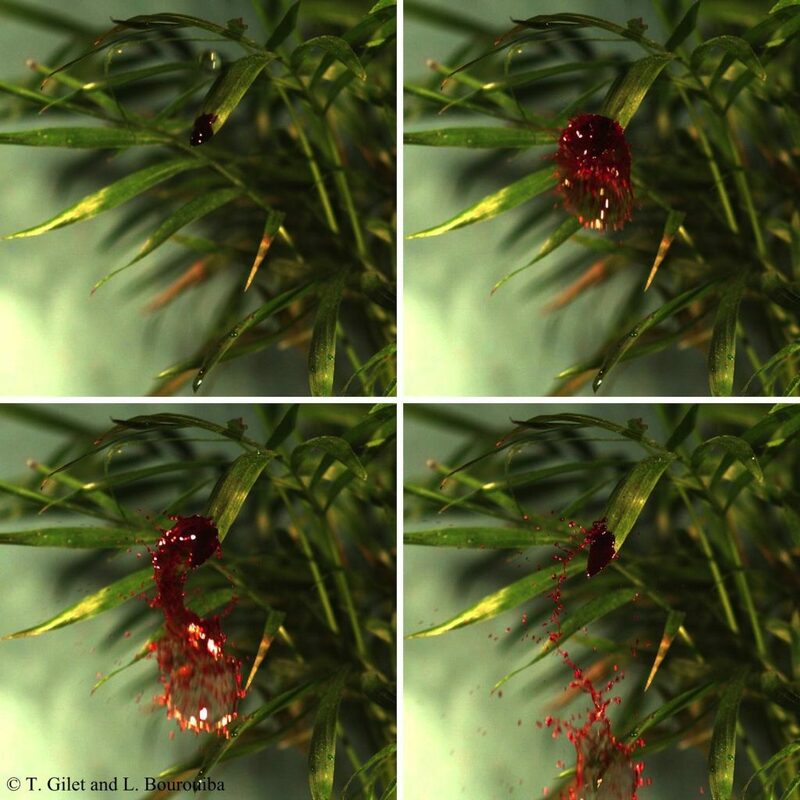 In splashing, the raindrop impacts the leaf next to the contaminated liquid residual, and violently pushes this latter out of the leaf. The contaminated liquid is then stretched as a liquid sheet that breaks up in a myriad of droplets. In inertial ejection, the raindrop does not necessarily touch the liquid residual. But it bends the leaf so much that when this latter springs back, it ejects the contaminated sessile drop by inertia. Splashing: A raindrop impacts next to a sessile drop on an Areca palm leaf. 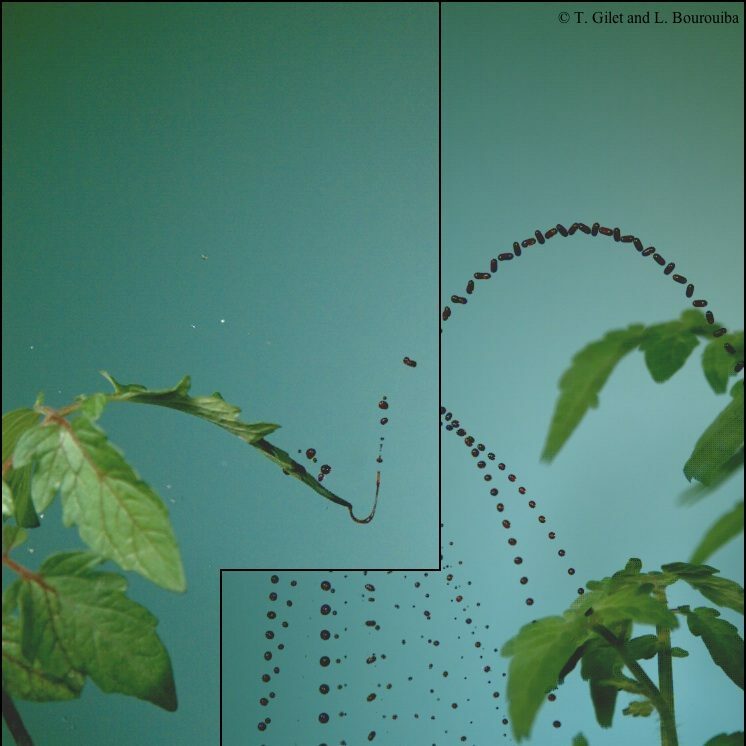 Inertial ejection: A raindrop impacts a tomato leaf. When the leaf springs back, it ejects some contaminated liquid residuals. We started to rationalize the influence of leaf geometry and mechanics on each scenario. These parameters can modify the propagation distance of the ejected droplets by a factor of 4 ! The subsequent risk of outbreak is therefore strongly dependent on the physical properties of the leaves. Our work suggests that alternating plants with different leaf properties (as in polyculture) can be beneficial to physically mitigate the propagation of agricultural diseases. Alternating plants with different leaf properties may reduce the risk of outbreaks.